Black A-line dress with windowpane-knit skirt. A little fit-and-flare for those who prefer frocks that move as they stride. It’s non-scratch and a good length. Excellent on a pear-shaped body type. As I write this dress is on sale for $79.99. A little sheer, but forgiving around the midriff, tummy and hip area nonetheless. The diagonal sleeves are short, but still pretty covered. Wear shapewear if it’s too sheer, and enjoy its avant-garde integrity. One of my clients bought this in grey and looks like a million bucks. This dress is genius and looks best on a gal with curves who can fill it out. It has excellent camouflaging integrity around the midsection and hips, if that part of the body makes you feel self-conscious. It also reduces the size of the bust with its low and asymmetrical neckline. You might need to size down a size. Also available in petite. A fab party dress with top-slit kimono sleeves and shutter pleats on the slim skirt. This frock is great on an apple or inverted triangle body type. It’s forgiving on top, but highlights narrower hips and fabulous legs. This is one of the best black dresses I’ve seen all year simply because it isn’t straight or all black. Flattering bateau neckline and elegant flared skirt. The see-through mesh inlays make the dress. You might need to size down. It also comes in petite sizing. This avant-garde dress/tunic is an easy “throw on and go” that makes a creative statement on its own. The genius design is amazing. It has two short zip fastenings, one on the right shoulder and another on the right side seam under the armhole, so that you can zip the front panel in two places creating different silhouettes. Wear it as a dress with hose, boots, booties or pumps. Or wear it over skinnies. You may need to size up one size. 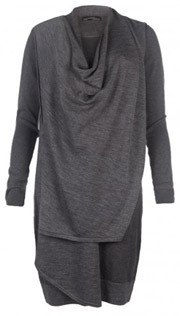 Sporty, casual, easy and sleeved. 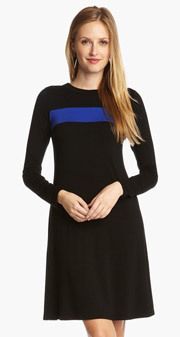 This colour block dress has a fun mod vibe and is a no-brainer with tall black boots or booties. Thick, drapey, and non-clingy. I love this 3/4 sleeve fit-and-flare dress. It’s a covered style in a flattering silhouette. Swap out the self-belt, add a pair of knee-high boots and you have a no-fuss polished look for work or play. The dress is machine washable and doesn’t require ironing, so it’s ideal for travel too. You may need to size up one size. This style is for Team Turtleneck. You’ve got to grab those sleeved and neck covering dresses with extra length when you see them because they are in very short supply. This midi frock is formfitting, but not clingy. Covered and graphic. Fab with pointy toe ankle strap pumps in the Summer, and with knee-high boots for Fall. Also available in blue, dark grey, and lace. You might need to size up one size. A knitted dress that’s weighty enough to not cling against the body. It’s quite genius! Structured in all the right places, machine washable, flattering, and pretty timeless. Great length, available in eight colours, and in plus and petite sizes.